Over the weekend I took some time away from blogging. Further than that, I took a break from the Internet. Manhattan is not a relaxing city, your senses need to be constantly alert. Its exciting and filled with interesting people, but its exhausting. Between work, commuting and blogging there are a lot of projects I've been sacrificing so I can get a post up every night. Today, I sat down and played with Photoshop for the first time since I got it a month ago! 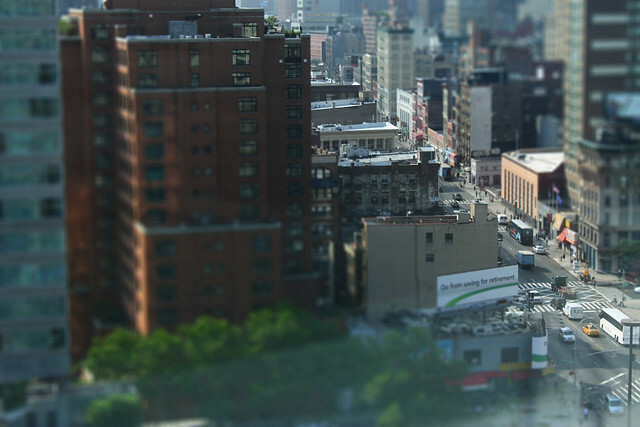 These are my first attempts at tilt shifted photos, and something I've been itching to try. Here is what I see everyday from my office at work. Looking north I can see the Empire State Building off in the distance. To the east is Canal Street. Its lovely to be high above New York City looking down at it from a distance and seeing birds and helicopters flying past. I especially love to look at the roof gardens on the lower buildings around us. What do you see out your window at work or school? Nice work!! :) That looks like my favorite hotel in the world, the Soho Grand in the second photo? It's good to take an internet break, I was having a bit of one myself! And you have the proper New York experience from your office by the looks of things. Ha, currently my view from work is the same as the view from my bedroom, so I try and shake it up a bit by going to cafes! What a great view; I like it <3. I understand what you mean. It's nice to have a little break from the computer every now and then! Love the photos, the effect is really cool. I bough photoshop a little while ago and still haven't found the time to play around with it! Great photographs, I'd love to have a view like that. Not many windows in the shop where I work, but we do have a big window in the back, and you can see fields and horses. When I have to start early, you can see the sunrise, which is absolutely beautiful! Love these - and it's really good that you took some time for yourself...I need to do that more. Nice pix. I've heard Photoshop has a steep learning curve so I've avoided it so far. Go luck with developing your skills. And, yes, we all need breaks from the Internet at times. you've got quite the view. it must be nice to get to look out onto that everyday at work. 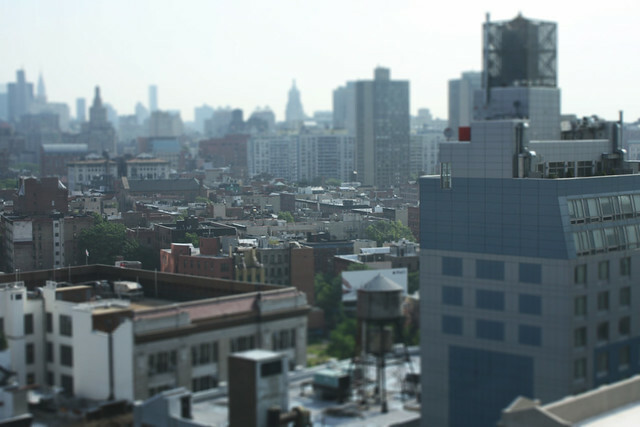 I was use trying to get the hang of tilt shift when my laptop died and I lost photoshop - gutted. I'd love a view like yours at work. I work down in a basement so I actually have no windows and no fresh air! truly gutted! I miss New York.. I was there very briefly, but being from Philadelphia, I really just miss the hustle and bustle of the city. I took a small break from blogging/the internet, and it was oddly liberating.. At first, I felt guilty, but then.. not so much. These photos are beautiful! I wish my view from work looked like that! I want to learn to use my camera properly so that I can learn to use the focus like that. Manhattan is crazy! I have lived here all my life and I leaving soon. I have mixed feelings about it, part of me is excited to slow it down a bit and another part is saying that there is no place like NY. I am writing about trying to appreciate NY in my last days here on a new blog. I would love for you to check it out!